In food-crazy Singapore, where an unprecedented two Michelin Stars were recently awarded to two humble street food stalls, you’d thus expect a venerable institution such as Pek Sin Choon to be a household name. However, unless you are a tea aficionado or a connoisseur of street food Bak Kut Teh (pork bone soup), the name is unlikely to ring a bell. Pek Sin Choon is one of the oldest tea merchants in Singapore. Founded in 1925 by Pek Kim Aw who immigrated to Singapore with his mother at age eight from Fujian province in China, at twenty years old he began to sell tea door to door. This coincided with the second world war, but those turbulent years did not deter him, rather spurred him on to succeed. Choon noticed the vanguard chugging Bak Kut Teh, sometimes pairing it with oolong tea, and he decided to concoct his own specialist blend. Thus his first oolong tea, Bu Zhi Xiang (Fragrance from Nowhere), was born. It was the first ever tea created to pair with a local food and was a runaway success. 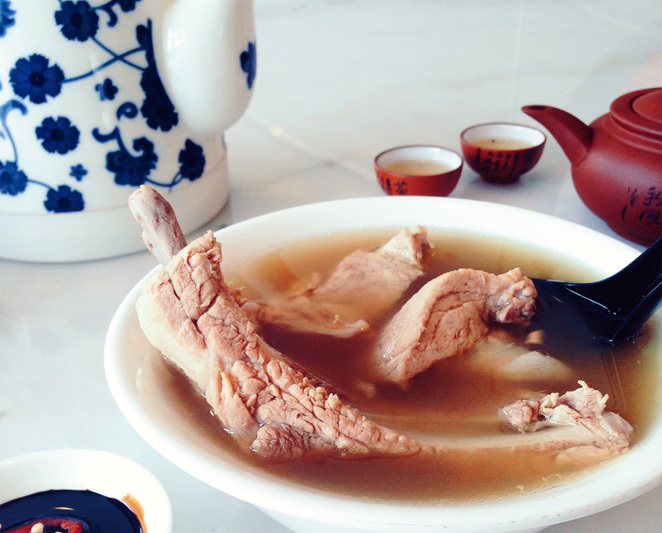 To this day, Pek Sin Choon supplies 90% of all Bak Kut Teh shops in Singapore, and is inextricably linked with the soup. Pek Kim Aw’s grandson, Kenry Peh, now holds the reins to this 91-year old tea enterprise. Chinatown, Pek Sin Choon on the right in the foreground with rounded yellow signage. On a sweltering day in Singapore, I decided to make a pilgrimage to this institution. Tucked along Mosque Street in Chinatown, is a nondescript shop that neither oozes historical charm nor retro chic. There’s no long queue like the Michelin-starred food stalls, no obtrusive formats of enticement save for a simple banner that describes the shop’s pedigree. Pek Sin Choon resonates simplicity. Right wall of the shop is stacked with teas from floor to ceiling. Inside, there stretches a floor-to-ceiling shelf along the right wall stacked with different teas. The left is crammed with tea paraphernalia and trinkets that could be objects from a family business’ time capsule. Perhaps this is the essence of Pek Sin Choon. There’s no veneer of make-believe old world charm masking the air as though doubled as a dusty museum; they breathe authenticity. They maintain a functional simplicity with teas still being wrapped in double sheets of paper and packed into rectangular pouches. The packaging has folksy illustrations that date back to before the war, giving them a unique look that eschew the modern day’s sleek packaging. I hoped to speak to Mr Peh, but he was unavailable due to the Moon Cake Festival (a mid-autumn celebration with traditional moon shaped desserts and tea). Pek Sin Choon sells across many Bak Kut Teh shops, so instead I sought to sample some paired traditionally with the food. The origin of the soup is unknown but it’s probable that, like most street food, it was an economical way to make a delicious meal out of cheap food materials available to labourers in the past. According to history, it was simply made of boiled pork bones with white peppercorns and garlic. Washed down with swigs of tea, it was served over rice and the warm drink alongside was said to cut through the fats of the pork. Among the many Bak Kut Teh shops, the most common Pek Sin Choon teas one will find are (from left) Xiang Zhi Zhi (trans: extremely extremely fragrant), Tie Kuan Yin (Iron Goddess of Mercy) and Bu Zhi Xiang (The Fragrance from Nowhere). They are all oolong teas. Tie Guan Yin was introduced before World War 2. Bu Zhi Xiang is of 1950s vintage. Xiang Zhi Zhi was launched in the late 1970s, and is said to be named after a popular character in a television series. Appearance-wise, all three teas look similar with an uneven mix of balled, rolled and stick type leaves. The liquids are light amber in colour. Brewed tea from left: Xiang Zhi Zhi, Tie Kuan Yin and Bu Zhi Xiang. Xiang Zhi Zhi emanates a fragrance of butter and cream with a hint of dry wood. When brewed, the aroma reveals darker, earthier notes of undergrowth. It’s easy to drink everyday as it is juicy with a tinge of woodiness. Tie Kuan Yiin exudes scent of chestnuts and cacao. Taking the hot cup close to the nose surprisingly reveals leather and tobacco notes that slowly evolve into creamy chocolate with the first sip. Bu Zhi Xiang explodes a bouquet of tobacco, mushrooms and wet soil. The brew gives forth dark, smoky notes accompanied a slight dryness as it hits the roof the palate. Although light in body, these three teas stand up very well against meaty dishes such as Bak Kut Teh. A delicious combination of meaty, peppery broth, provides a soothing, comforting reminder of my grandmother and my childhood in the back alleys of old Singapore, a memory I suspect many Singaporeans will share. Oolong tea is a great palate cleanser and one that is good for digestion after a healthy meal. 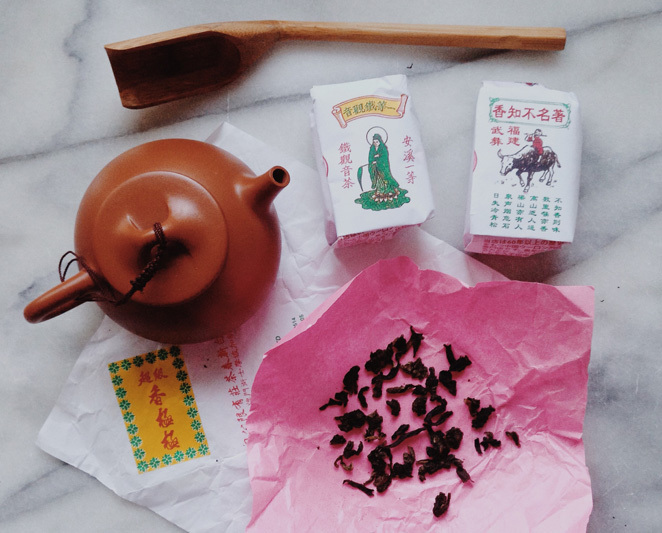 Pek Sin Choon is a brand with a lot of history poured into each cup. Inhale its earthy aroma and remember that young tea merchant of the 20th century brewing his way, unknowingly, to a flavour that would last longer than he could live to see.